When landscape gardener Chris Booth went out to meet up with friends for a drink one night 20 years ago, he didn’t realize that it was a journey that would change his life. On the way there, a drunk driver ran into him head-on. Chris was thrown into the windshield, bashing his head on the steering wheel on the way through. While he recovered quickly from the physical injuries, he believes the accident was the start of a lifetime of tinnitus. My story started in 2011. I woke up with a ringing in my ear that was faint, but annoying. In two weeks’ time, it developed into a constant, loud, high-pitch screeching. It has traveled to the other ear and sometimes felt like it was in my entire head. Neuromonics Oasis saved my life!! 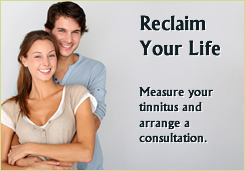 I was first aware of having tinnitus when I was about 14, about 30 years ago. I thought everyone had it, that it was part of growing up. Yes it bothered me, it was horrible, but I just lived with it.